I spent twenty two years of my life as a people pleasing machine. I was good. I mean it. You would have loved me. Then God showed me my heart, and began to make me into something new. I am still not completely rebuilt into His Son’s image, and I still struggle with the tendency to fall back into my sinful ways. As such, I frequently have to confess what the Puritan pastor, Richard Baxter, would have called excessive man pleasing. I hate that term, which is why I also like it. I hope you feel the same tension. 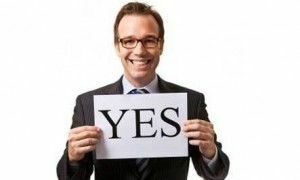 I am writing this article as a pastor to the church. As I look out and survey the state of the church in America I see a pattern of shallow relationships and deft accountability avoidance. We have adopted a consumerist approach to the Christian life which values relational breadth over spiritual depth, calm spirits over gospel peace, and happy parishioners over holy nations. We have bowed our knee to the spirit of the age: non-confrontational, non-committal, religious people pleasing. Heavy, I know, but read further. It gets happier. Below are listed eleven confessions pretty common among my fellow pleasers and I. Read them and see if they sound like you, and if they sound applicable to you, don’t feel bad; just keep reading until you get to the less common, but far more important, twelfth confession. I deeply desire the pleasure of God, but I feed off the pleasure of people. I want to do what is right, and after I do, I want you to notice it, admire it, and tell your friends about it. Praise the Lord for Facebook! I want people to be happy, not holy. Although I talk about what is right, I settle for people saying I’m right. I frequently find peace, because I fervently flee conflict. The amount of attention someone gets from me varies directly with the amount of praise I get from them. Although I am called to fish for men, I usually set my bait for compliments. I might accidentally trample the gospel, but I will never step on your toes. I am a constant encourager. . . to your face. I will never tell you no, and sometimes I keep my word. Jesus is King, and I serve Him. This simple confession, if believed and followed, has the potential to revolutionize your heart, your personality, and ministry. Confess Jesus as your King and stop bowing to the capricious god of public approval. When you learn to serve the one, true King you will find the peace you have been faking, joy you have been missing, and love that cannot be earned – not by you anyways. Jesus earned the Father’s pleasure; by His grace, you get to enjoy it. In this series of Thinking It Through, we will be thinking through the book Death By Living, by N.D. Wilson. This series is meant to share what has shaped me and influence your future shape as well. One Sentence Theme of Chapter 1: Life is a story, but the story is bigger than you think, which makes God both bigger and smaller than you’d expect. Explanation: One of Wilson’s most consistent themes throughout Death By Living is reading your story in context with the stories which led to your story. Wilson traces this theme through the narratives of his grandparents and the crucial points at which various people and events radically altered their fate (and his, by extension). In the opening chapter, it seems Wilson’s aims to shake the dust off of Story, our banner-worthy buzzword, and examine it with fresh eyes. “Story, story, my life is a story,” says the hipster to his Twitter feed. Right. Narrative. Story. Boy, it sounds nice and groovy, but it’s coming from someone who barely has enough of an attention span to get through a Web clip of over four minutes, and may the postmodern gods show their mercy if the atmospheric WiFi wanes or his little browser starts buffering. Not quite. So, I go on with my buying. Now I have encountered many great books throughout my life. Here is a brief list of the ones that stand out in my mind. A Severe Mercy by Sheldon Vanauken for the beauty of his writing and the profundity both of his life experience and his correspondence with C.S. Lewis. The Chronicles of Narnia by C.S. Lewis for the joy of discovering allegory as a little child. Mere Christianity by C.S. Lewis for introducing me to the intellectual rigor supporting the Christian faith. 7 Habits of Highly Effective People by Steven Covey for helping me learn to handle responsibilities as a leader. Atlas Shrugged by Ayn Rand for exposing my 15 year old self to the power of story in promoting philosophy. The Screwtape Letters by C.S. Lewis and Anthem by Ayn Rand for showing how perspective and language can engage a reader. Ender’s Game by Orson Scott Card for giving me my first grasp of pluralism, long before pluralism was cool. The Harry Potter Series by J.K. Rowling for awakening me to the incredible, world building power of imagination. John Grisham for thrilling me, and Dean Koontz for scaring me. Desiring God by John Piper for redirecting my perception of God, and forever changing my pursuit of him (this one is a must read if you have not). The myriad of classics and all the virtues, counter-virtues, and character traits they teach: 1984, Lord of the Flies, Dracula, The Odyssey, Edith Hamilton’s Greek Mythology, Pilgrim’s Progress, and more. These are just the ones that popped into my mind as I wrote. The list could go on and on and on. The books we read become part of our lives, and I want my life to be as big as I can make it! So I read. A number of years ago, I stumbled upon a Christian writer by the name of G.K. Chesterton who introduced me to something I had not experienced before – the power of artful prose. Chesterton was a master of blending humor with profound insight through witty and winsome turns of phrase. His writing was artful. It was delightful. Chesterton gave me an appreciation for the unique voice of a truly gifted writer. 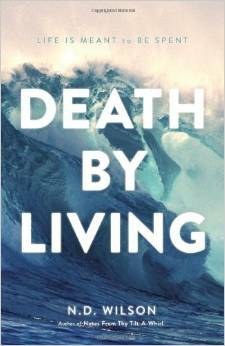 It was a step that led me to appreciate the book I will be writing about for the next few posts: Death By Living. N.D. Wilson, the author of Death By Living, has the most unique voice I have ever read. I am no literary critic, so I don’t even know how to categorize his writing style other than to say it is a precisely directed stream of conscious poem written in prose. His flow of thought shifts from the present to the past, from philosophy to storytelling, from somber reflection to hilarious irony. It is one of the truly unique books I have ever read. Aside from his writing, which is worth reading regardless of the content, the content is dumbfounding. What I mean is that Wilson walks you through the story of his life and invites you to consider your own. He sets his story firmly in the squishy middle of a much bigger story involving illiterate farm boys, WWII bomber raids, and children engrossed in Lego wars. His story also includes death, as all of ours will. He invites you to join him in considering the implications of living a life worth dying for. In short, this book made me feel inspiration, wonder, and whimsy unlike any other book I have read. As such, I want to go back and think my way through it, which is to say, I want to write my way through it. If you have not read it, I hope my thoughts can inspire you to buy it and put it on your list. Grab a rented raft, hop in the rinkiest-dinkiest sea kayak you can find. Pull on a puffy orange life vest and buckle it (rather awkwardly) between your legs. Brandish your paddle. Ignore all sunscreen. By the time we’re done, you’ll be chafed in such new and innovative ways that the familiarity of a sunburn just might be a comfort, a little tingling reassurance that you are still you.